If you had a choice do you go crunchy or chewy? I almost always vote crunchy. Seems like monster cookies have been around forever. 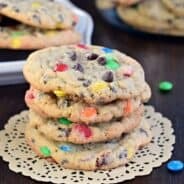 I’ve loved the “idea” of a monster cookie, I mean, after all, it’s filled with oats, peanut butter, chocolate chips and m&m candies. Sounds great. And you don’t usually see a crunchy monster cookie. The other day I was at Costco and they had crunchy oatmeal crisp cookies in the bakery. (yes, I scout bakeries for ideas…even costco). Anyways, these cookies were thin and crispy (can you picture them)? So it occurred to me, why not make a crunchy, crispy monster cookie? These cookie crisps are almost more like a bark. Delish. Plus it makes a ton of them for sharing with others. Which I do every once in awhile. Now it’s about 40 degrees outside and my house is chilly. Guess it’s time to make another batch! In mixing bowl, add butter and brown sugar until combined. Stir in flour, salt, and baking soda. Mix in the peanut butter. Slowly stir in oats and cereal. Press dough onto a large parchment paper lined cookie sheet (mine was 15x10inch). Bake in a 350 degree oven for 20-25 minutes until browned. Allow to cool in pan completely. To finish, spread melted chocolate over top of cookie bark. Immediately sprinkle with m&m candies. Allow to set (about 20 minutes). Cut into triangular pieces and serve! ENJOY! Oatmeal, rice krispies, peanut butter and chocolate? Oh yes please! I could actually get away with calling these healthy. After all Oatmeal is good for your heart, Peanut butter is a protein, and Rice Krispies have 8 or 9 vitamins and minerals. That does it, these are healthy! Now I can have them for breakfast and snack on them all day long! Can’t wait to make up a batch. Pinned! I love this idea! Crunchy is awesome. 🙂 And monster anything, well, is perfect! 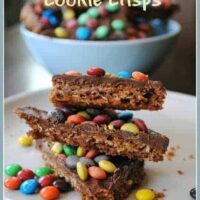 Oh my gosh, these cookie crisps look friggen amazing!! I want to be the cookie monster and eat them all!! haha! Love this comment! Thanks Jennifer! These look perfect to me! I have to admit…I prefer a chewy granola bar. But…all that yummy monster goodness would get me to eat a crunchy bar. I like the way Joan thinks…they kind of sound like a healthy snack to me;-) wink, wink! I like all things krispy. These look yummy. 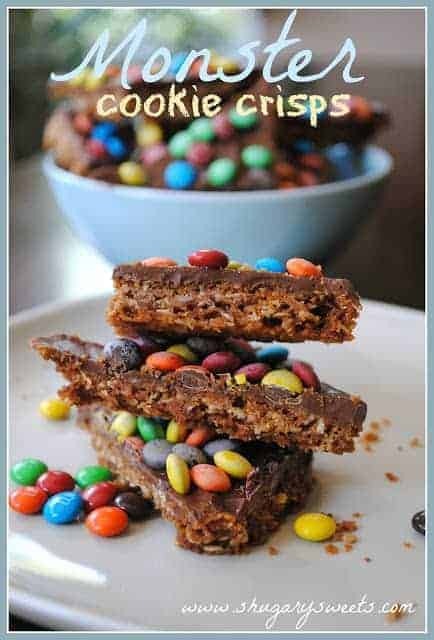 I usually go for crispy over chewy, too and these look amazing! Sooooo fun! Love the colorful m&m topping. Yum!! I LOVE crispy crunchy granola bars!! And, of course, I LOVE monster cookies!!! Are you Captain Crunch? Seriously? 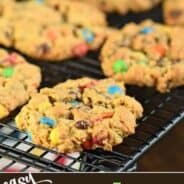 You totally crunchified monster cookies and I LOVE it. Why yes. I’ve been found out. My name is Aimee aka Shugarysweets aka Capt Crunch. hehehehe!!!! Oh wow, these look great! We’ll be making these soon! 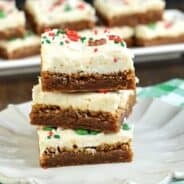 never tried a cookie bark, now i really want to!! YUM! Fun treat! My nieces and nephews would absolutely adore making this with me! I’ll have to pull this out next time I babysit!! 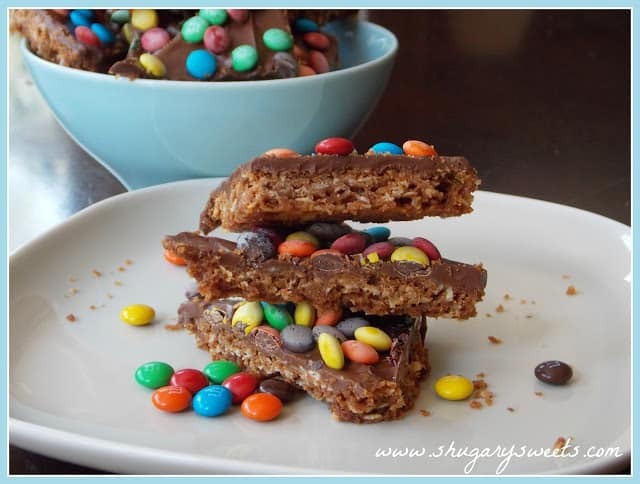 Chocolate and peanut butter are always a great combo, adding the m&m’s and rice krispies sold me even more! Can’t wait to try these! What a fantastic idea! I love the idea of making it a crunchy treat! Gina @ Kleinworth & Co.
Well don’t those look great. My kids will love them. My weekly linky party–One Creative Weekend–has gone spooky this week in honor of my thirteenth party. If you haven’t already, I hope you’ll visit “One Creative Weekend” on OneCreativeMommy.com (open every Fri-Wed) and link up this idea and anything else you’d like to share. (You can include non-Halloween posts as well, but feel free to link up as many Halloween-themed posts as you like.) There are two categories—one for Halloween and one for everything else. How do you think these would be with Sunbutter for my nut-allergy little guy? Have you substituted sunbutter in the past for baking? If so I think it would be perfect. Biscoff is also nut free and would make a delicious alternative!